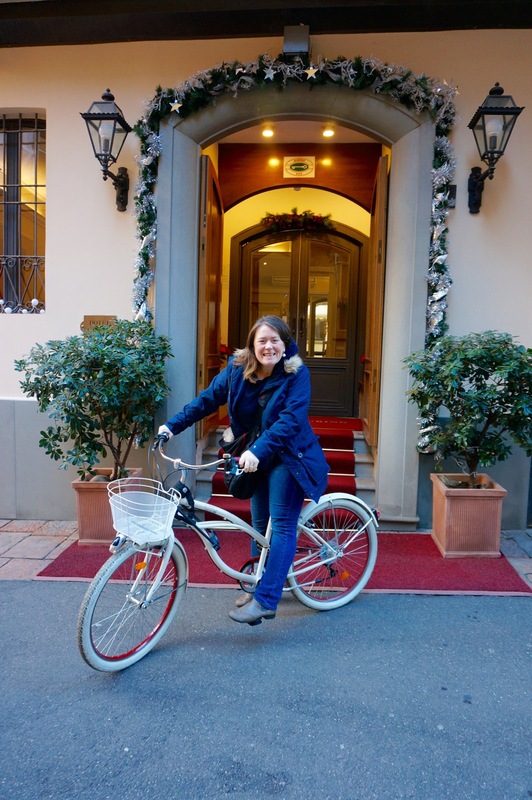 Penny just returned from a pre Christmas break at Hotel Touring, Bologna. 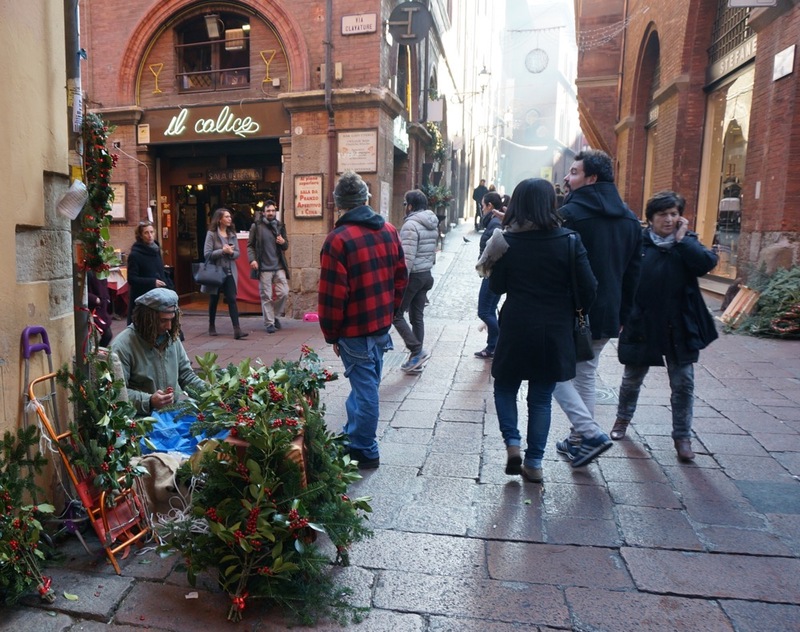 She can’t wait to give you the full low down on this unsung hero of an Italian city, but for now, take five minutes with a mulled wine or hot chocolate and explore another city at Christmas. 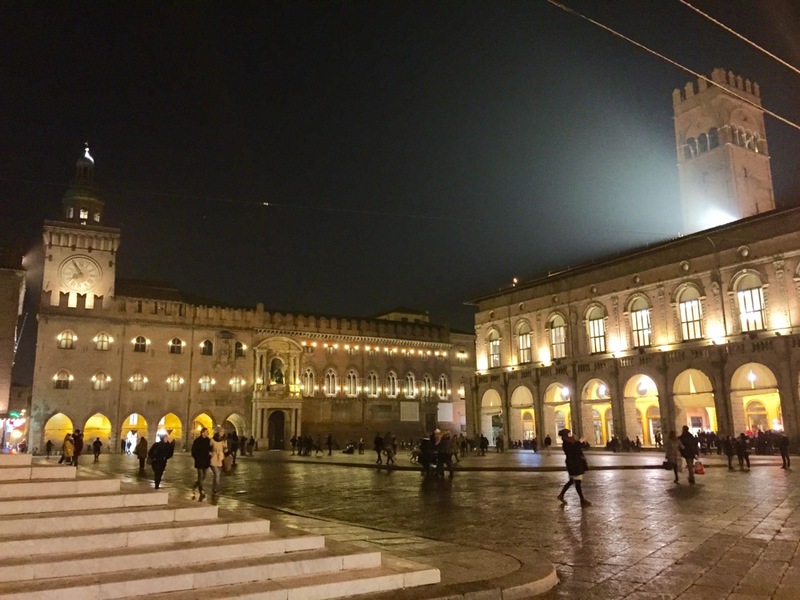 I have so many reasons why you would love Bologna, and I will be back soon to tell you all about the food, the romance of this medieval walled city with kilometres of porticos and frescos. 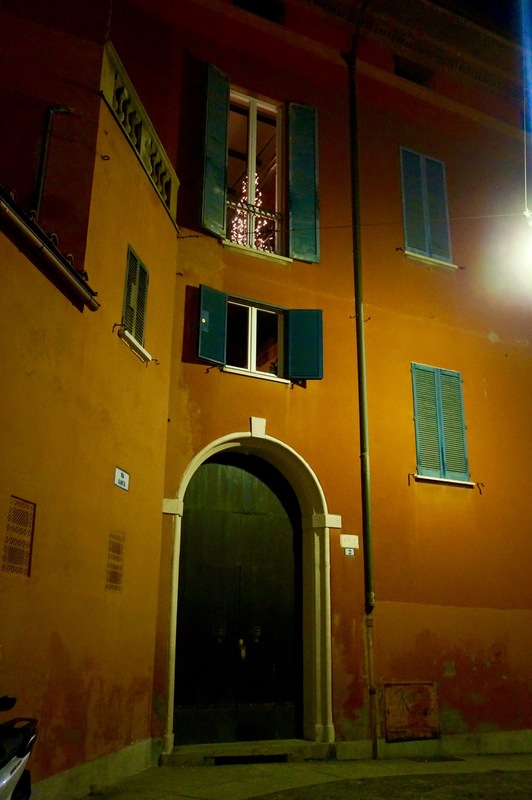 The best thing it is a small city with a big heart and an amazing culinary history, many people call it the foodie capital of Italy. 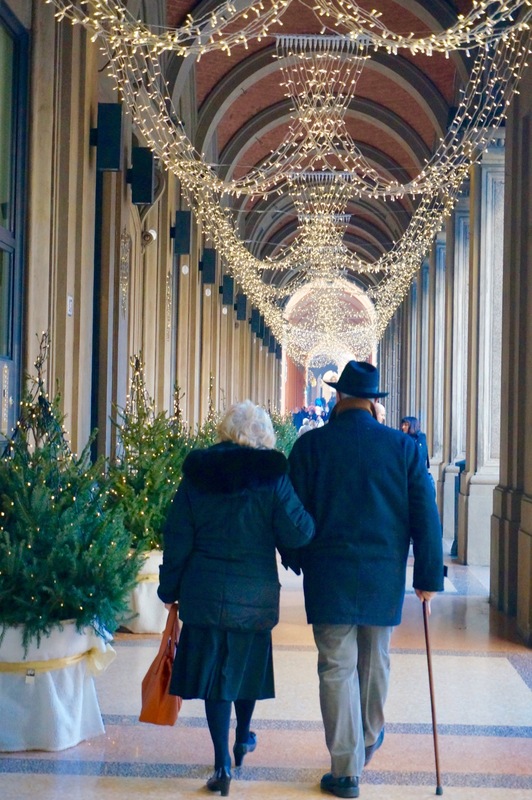 Having visited with my kids I also know works as well for families as it does for couples seeking romance, or in my case, for my second visit, for old friends seeking time to catch up, celebrate the start of the holiday season and do a few last minute bits of Christmas shopping. The welcome at family run Hotel Touring is like no other, I can’t wait to share more about this hotel, but Georgia, Manuela and Matteo, and all the staff, went out of the way to make us feel at home, by leaving little notes, sending us festive instagrams and recommending the best to see, eat and do. 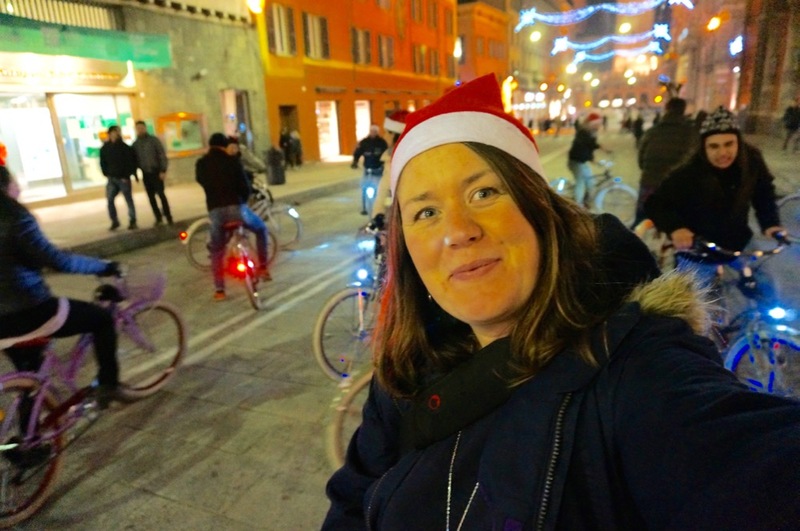 Hence I found myself on a bike, touring the city’s best food bars, in a Santa hat, with Bike in Bo, and a fabulous group of Italians within hours of arriving. 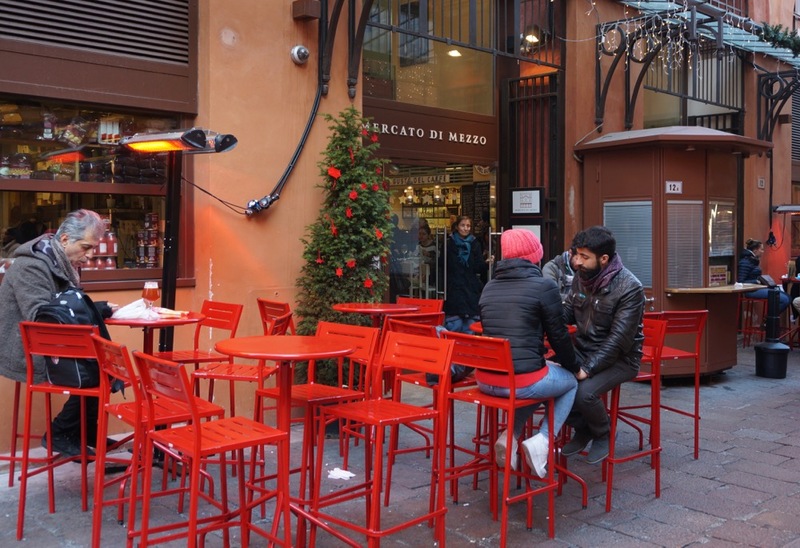 Bologna oozes character and looks perfect at this time of year, with fairy lights strung from its porticoes and tasteful garlands of green and red gathered around the most inviting cafes, food stalls and shops. You won’t see tinsel, but you will see lots of Christmas sparkle. 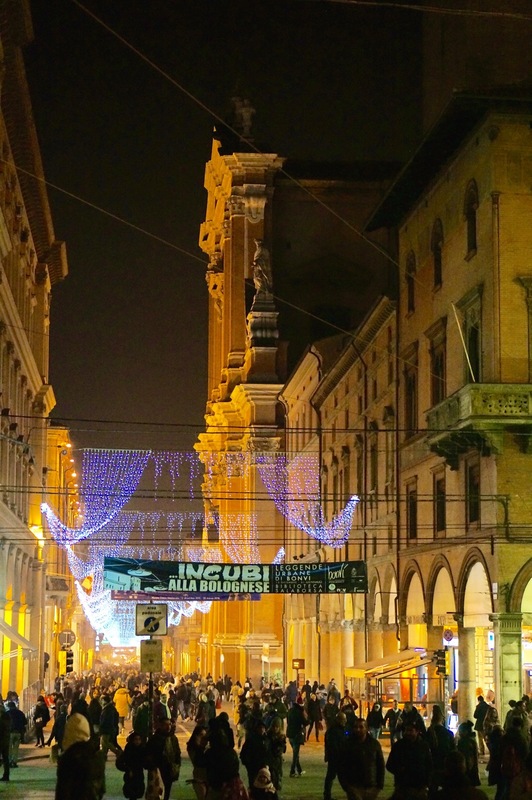 Apart from being an amazing city to sit and watch the world go by from, Bologna is also incredible for shopping, with everything from Christmas and vintage markets to the newest trendsetters and the likes of Gucci and Prada. Everything is within a very small area so it is easy on the feet. 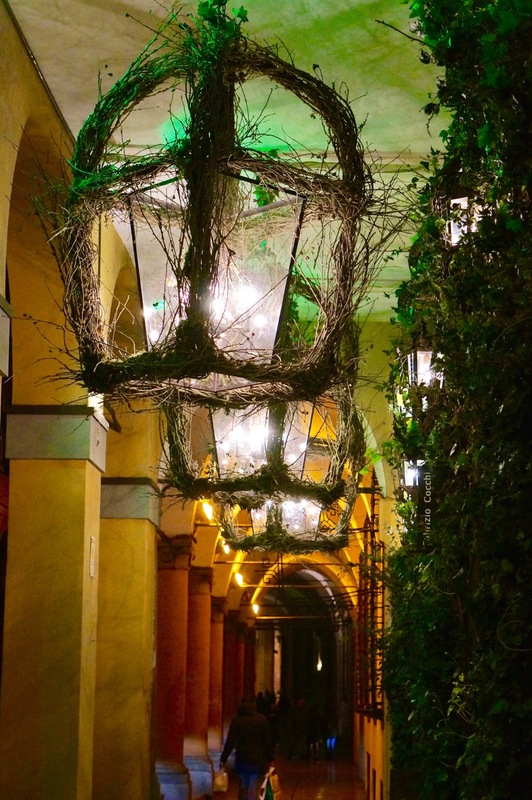 The endless porticoes are dripping with fairy lights and lined with Christmas trees. There was plenty of inspiration for decor too, some shops have some incredible creations. 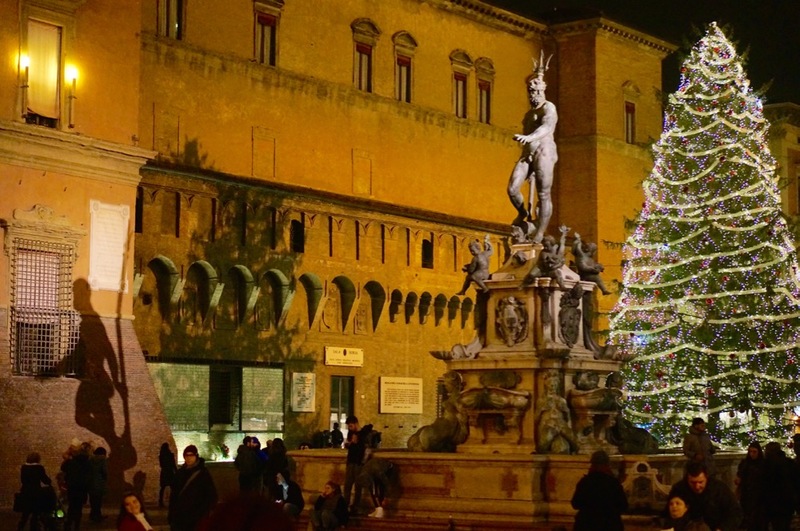 The city’s stunning medieval architecture really comes to life at night, here the famous fountain with Poseidon in Piazza Maggiore looks even more stunning next to the twinkling lights of the Christmas tree. 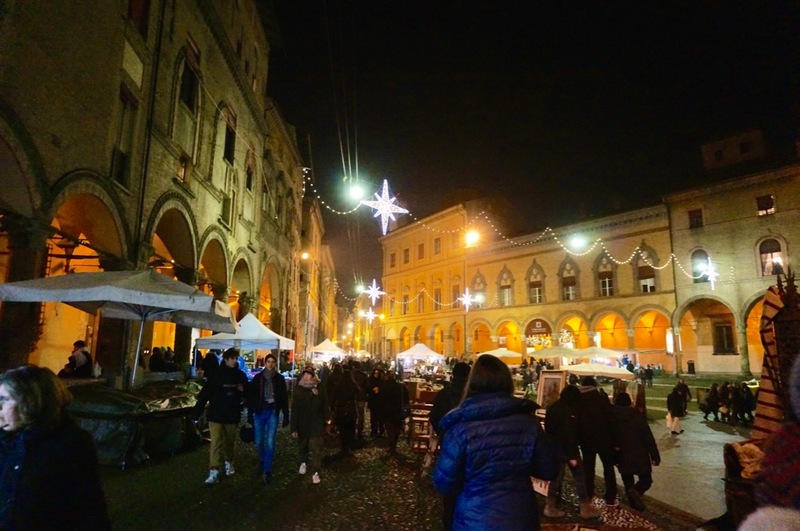 The streets are buzzing with people gathering together to eat, drink, shop, but the pace is relaxed and shops and bars never felt over crowded. 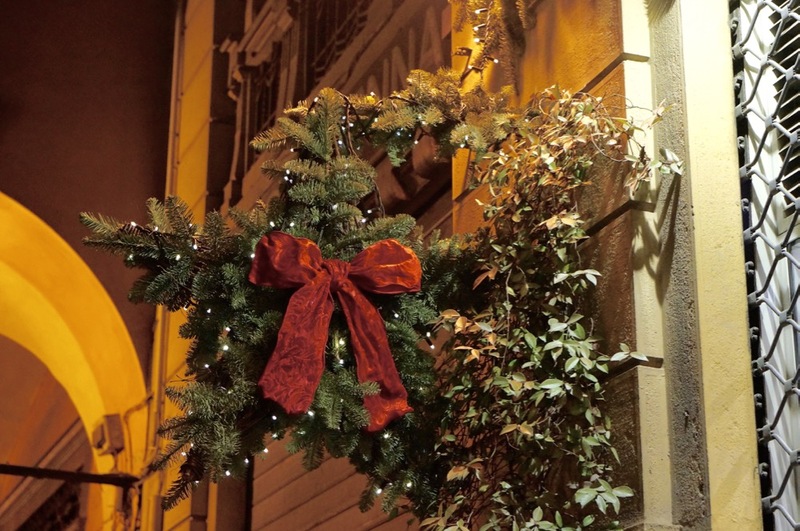 Nor does it feel touristy – December seems like a great time to visit. This is Saturday night, at its busiest here, the daytime was much quieter. Shopping was relaxing, people seem to be slowly gathering the last bits, many street corners have people making wreaths and garlands. It’s a far cry from the Christmas high streets of the UK, shopping was a really pleasant experience. 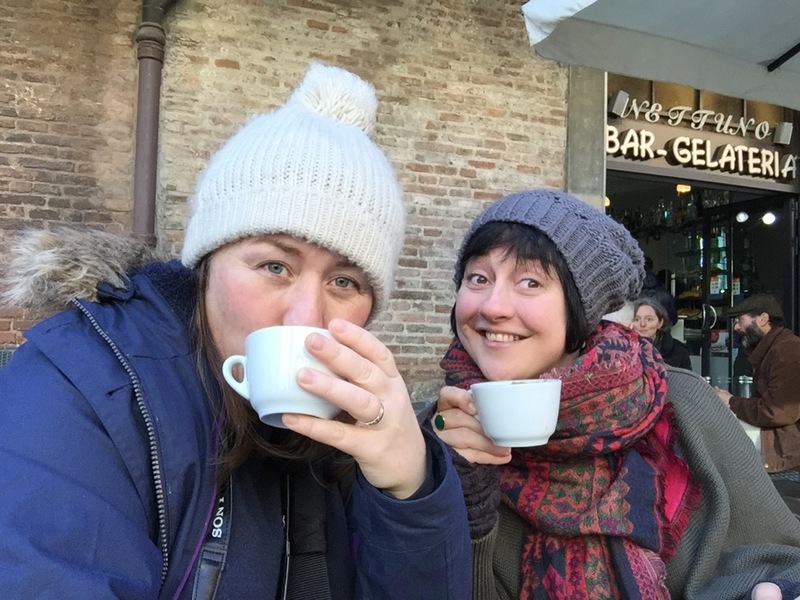 Bologna is bursting with street food, cafes, restaurants, there are so many incredible places to refuel, Italians are great at taking proper breaks while shopping. We stopped to watch the world go by and drink hot chocolate, it was like liquid cake. 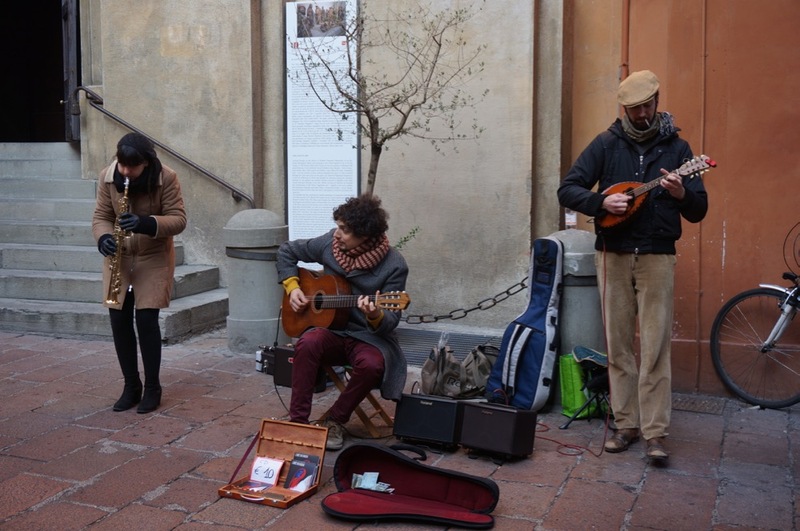 People take the time to stop and watch buskers and everywhere people were dancing in the street. So magical, so romantic. 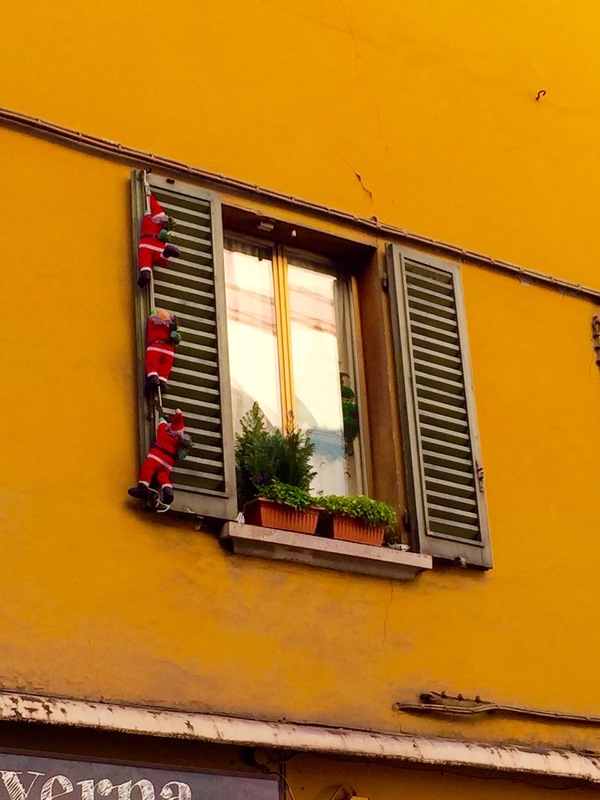 And Santa Claus is forever attempting death defying climbs up Bologna’s walls. There is something so magical about watching Christmas unfold in another city, and being a visitor surrounded by the joy that brings its inhabitants. 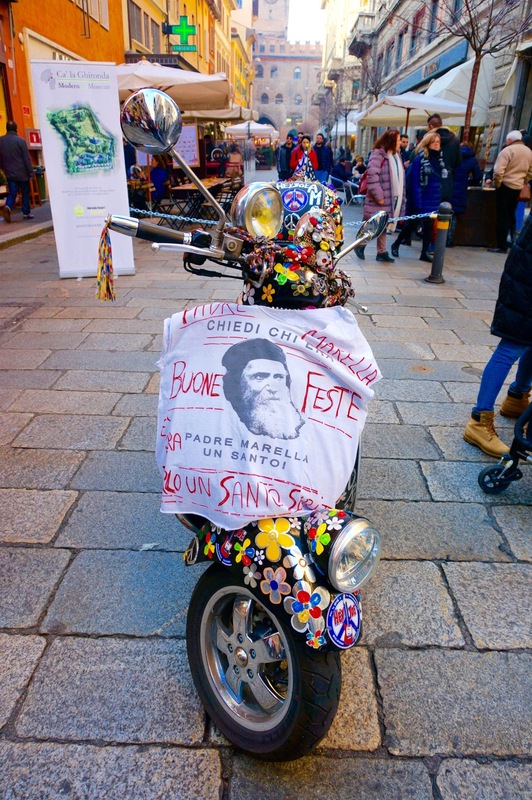 The welcome was warm and the buzz contagious, yet I was reminded, by Italian culture, to slow down and truly savour the season too. The perfect slice of invigorating travel, before returning home to the arms of my family, feeling fully festive and ready to celebrate. Penny and friend, were the guests of Hotel Touring, mention Penny Alexander Blog for a 15% discount. Check out the Hotel Touring roof terrace with stunning views of Bologna people come from far and wide to visit on Penny’s blog. 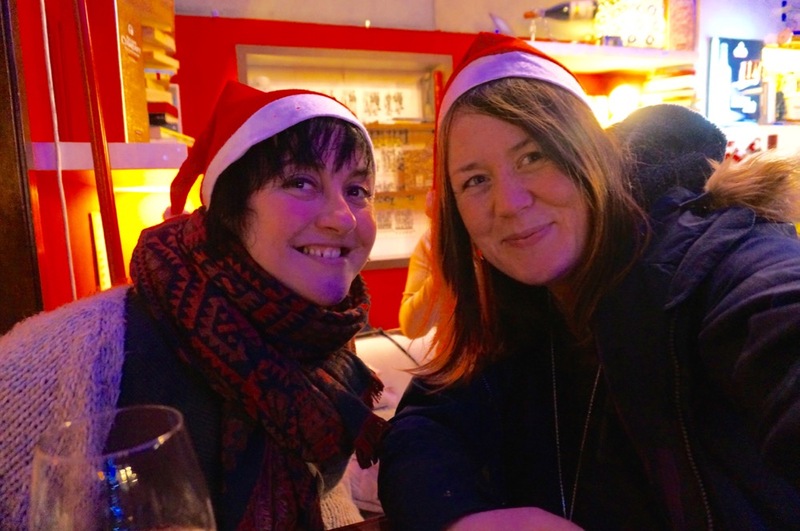 Also check out Penny’s trip to Bologna with kids, and her guide to Bologna for grown ups.